Most people think of General Tso’s as a deep fried dish but if you add the General Tso’s sauce to stir fried veggies or chicken or chickpeas, you get the same delicious flavor only healthier! And it is so quick and easy! This General Tso’s sauce is adapted from Pinch of Yum and is a huge hit in our house! It’s a little sweet, a little spicy and so delicious. We made the sauce separately and while it thickened, prepped and sautéed some peppers, broccoli and chickpeas, then added the sauce. That’s it! All you need… feel free to switch up the veggies! Or even add chicken! The sauce is super easy. 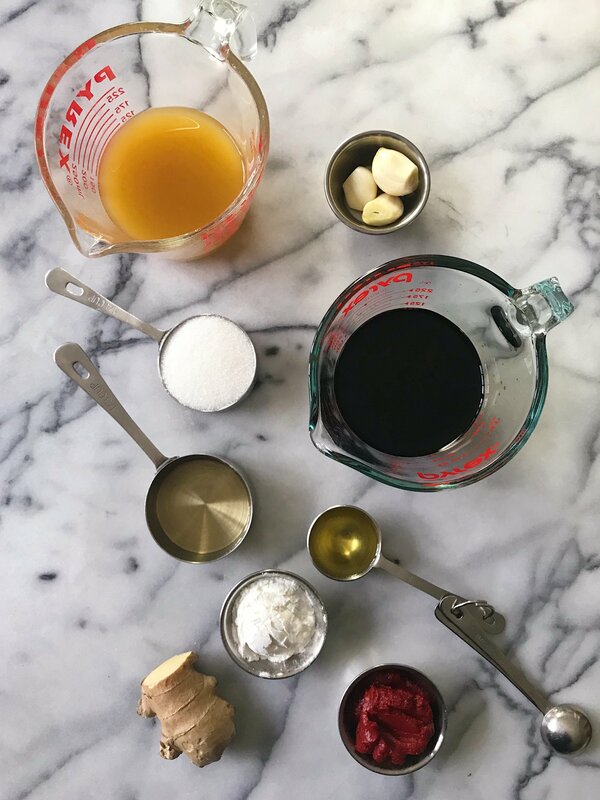 It is made with 9 ingredients and comes together quickly, so I recommend gathering your ingredients before starting…. 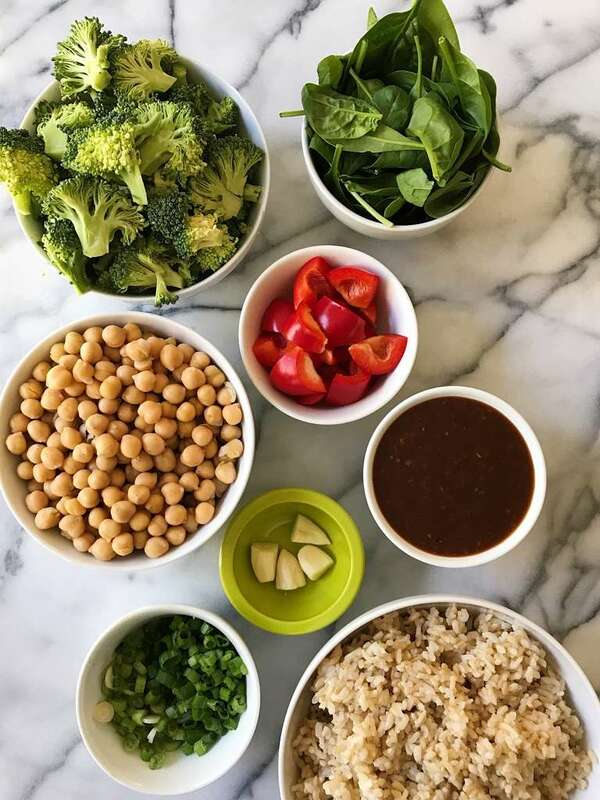 you’ll need sesame oil, garlic, ginger, vegetable broth, gluten-free tamari or soy sauce, rice wine vinegar, sugar, plain tomato paste and cornstarch. Like all our recipes, this one is very customizable — You can substitute chicken for chickpeas or as we do in our house – make chicken AND chickpeas! You can also switch up the veggies depending on what you have in the house and your preferences. Any way, it is delicious! A healthier and delicious take on the classic deep fried dish -- plus it's gluten-free and plant-based! 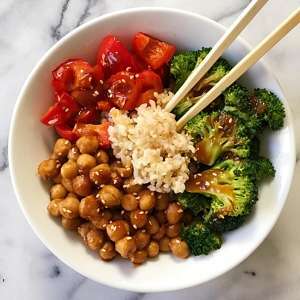 Sautéed veggies, chickpeas or even chicken stir fried with a General Tso's sauce. A quick and easy weekday meal. In a small saucepan, heat the sesame oil over medium low heat. Add remaining ingredients and whisk to combine. Simmer for 10-15 minutes or until sauce is thickened. Set aside. Note: Sauce will thicken when it cools, then thin up again when heated. In a large skillet, over medium high heat, add 2-3 tbsp oil and heat until shimmering but not burning. Add white parts of onions and some of the green parts, and saute a minute or two until just tender. Add garlic and saute about 30 seconds or until fragrant. Add peppers and saute 3-4 minutes until starting to get tender. Add broccoli, cook an additional 2-3 minutes. Then add in chickpeas and saute 1-2 minutes until warm. Cook longer for softer vegetables. Add the General Tso's sauce to the sauteed vegetables and stir to combine. Heat 2-3 minutes until warm. The longer the sauce simmers with the vegetables and chickpeas, the more they will absorb the flavor of the sauce. Serve over rice. Garnish with sesame seeds and additional green parts of onion if desired. OPTION: In place of chickpeas you could saute chicken but cook the chicken first, then add in the peppers and broccoli. NOTE: to keep the veggies and chickpeas separate in this photo, I sautéed them each separately. First the peppers, then set aside; then the broccoli, then set aside; then the chickpeas. I added some of the sauce directly to the chickpeas and let them simmer. Then added the additional sauce on top of the veggies. I absolutely loved this! The flavors are so good! Great! So glad you loved it too! It is one of our favorite stir fry meals! I made this and it was fantastic. Thank you so much!! Great! It is a regular in our rotation — so happy you love it too! So happy you love it as much as we do! Adding Tempeh is a great idea!